John Clare (13 July 1793 – 20 May 1864) was an English poet, the son of a farm labourer, who came to be known for his celebratory representations of the English countryside and his lamentation of its disruption. His poetry underwent a major re-evaluation in the late 20th century, and he is now often considered to be among the most important 19th-century poets. His biographer Jonathan Bate states that Clare was "the greatest labouring-class poet that England has ever produced. No one has ever written more powerfully of nature, of a rural childhood, and of the alienated and unstable self". Clare was born in Helpston, six miles to the north of the city of Peterborough. In his lifetime, the village was in the Soke of Peterborough in Northamptonshire and his memorial calls him "The Northamptonshire Peasant Poet". Helpston now lies in the Peterborough unitary authority of Cambridgeshire. He became an agricultural labourer while still a child; however, he attended school in Glinton church until he was 12. In his early adult years, Clare became a potboy in the Blue Bell public house and fell in love with Mary Joyce; but her father, a prosperous farmer, forbade her to meet him. Subsequently he was a gardener at Burghley House. He enlisted in the militia, tried camp life with Gypsies, and worked in Pickworth as a lime burner in 1817. In the following year he was obliged to accept parish relief. Malnutrition stemming from childhood may be the main culprit behind his 5-foot stature and may have contributed to his poor physical health in later life. Clare had bought a copy of Thomson's The Seasons and began to write poems and sonnets. In an attempt to hold off his parents' eviction from their home, Clare offered his poems to a local bookseller named Edward Drury. Drury sent Clare's poetry to his cousin John Taylor of the publishing firm of Taylor & Hessey, who had published the work of John Keats. Taylor published Clare's Poems Descriptive of Rural Life and Scenery in 1820. This book was highly praised, and in the next year his Village Minstrel and other Poems was published. He had married Martha ("Patty") Turner in 1820. An annuity of 15 guineas from the Marquess of Exeter, in whose service he had been, was supplemented by subscription, so that Clare became possessed of £45 annually, a sum far beyond what he had ever earned. Soon, however, his income became insufficient, and in 1823 he was nearly penniless. The Shepherd's Calendar (1827) met with little success, which was not increased by his hawking it himself. As he worked again in the fields his health temporarily improved; but he soon became seriously ill. Earl FitzWilliam presented him with a new cottage and a piece of ground, but Clare could not settle in his new home. Clare was constantly torn between the two worlds of literary London and his often illiterate neighbours; between the need to write poetry and the need for money to feed and clothe his children. His health began to suffer, and he had bouts of severe depression, which became worse after his sixth child was born in 1830 and as his poetry sold less well. In 1832, his friends and his London patrons clubbed together to move the family to a larger cottage with a smallholding in the village of Northborough, not far from Helpston. However, he felt only more alienated. It is most singular that ever since he came… the moment he gets pen or pencil in hand he begins to write most poetical effusions. Yet he has never been able to obtain in conversation, nor even in writing prose, the appearance of sanity for two minutes or two lines together, and yet there is no indication of insanity in any of his poetry. In 1841, Clare absconded from the asylum in Essex, to walk some 90 miles (140 km) home, believing that he was to meet his first love Mary Joyce; Clare was convinced that he was married to her and Martha as well, with children by both women. He did not believe her family when they told him she had died accidentally three years earlier in a house fire. He remained free, mostly at home in Northborough, for the five months following, but eventually Patty called the doctors in. Between Christmas and New Year in 1841, Clare was committed to the Northampton General Lunatic Asylum (now St Andrew's Hospital). 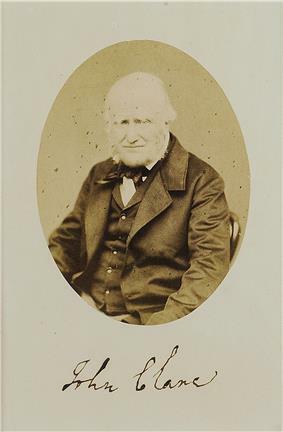 Upon Clare's arrival at the asylum, the accompanying doctor, Fenwick Skrimshire, who had treated Clare since 1820, completed the admission papers. To the enquiry "Was the insanity preceded by any severe or long-continued mental emotion or exertion? ", Dr Skrimshire entered: "After years of poetical prosing." He remained here for the rest of his life under the humane regime of Dr Thomas Octavius Prichard, who encouraged and helped him to write. Here he wrote possibly his most famous poem, I Am. He died on 20 May 1864, in his 71st year. His remains were returned to Helpston for burial in St Botolph’s churchyard. Today, children at the John Clare School, Helpston's primary, parade through the village and place their "midsummer cushions" around Clare's gravestone (which bears the inscriptions "To the Memory of John Clare The Northamptonshire Peasant Poet" and "A Poet is Born not Made") on his birthday, in honour of their most famous resident. Clare grew up during a period of massive changes in both town and countryside as the Industrial Revolution swept Europe. Many former agricultural workers, including children, moved away from the countryside to over-crowded cities, following factory work. The Agricultural Revolution saw pastures ploughed up, trees and hedges uprooted, the fens drained and the common land enclosed. This destruction of a centuries-old way of life distressed Clare deeply. His political and social views were predominantly conservative ("I am as far as my politics reaches 'King and Country'—no Innovations in Religion and Government say I."). He refused even to complain about the subordinate position to which English society relegated him, swearing that "with the old dish that was served to my forefathers I am content." His early work delights both in nature and the cycle of the rural year. Poems such as "Winter Evening", "Haymaking" and "Wood Pictures in Summer" celebrate the beauty of the world and the certainties of rural life, where animals must be fed and crops harvested. Poems such as "Little Trotty Wagtail" show his sharp observation of wildlife, though The Badger shows his lack of sentiment about the place of animals in the countryside. At this time, he often used poetic forms such as the sonnet and the rhyming couplet. His later poetry tends to be more meditative and uses forms similar to the folk songs and ballads of his youth. An example of this is Evening. His knowledge of the natural world went far beyond that of the major Romantic poets. However, poems such as "I Am" show a metaphysical depth on a par with his contemporary poets and many of his pre-asylum poems deal with intricate play on the nature of linguistics. His "bird's nest poems", it can be argued, illustrate the self-awareness, and obsession with the creative process that captivated the romantics. Clare was the most influential poet, aside from Wordsworth, to practice in an older style. Copyright to much of his work has been claimed since 1965 by the editor of the Complete Poetry, Professor Eric Robinson, though these claims were contested. Recent publishers have refused to acknowledge the claim (especially in recent editions from Faber and Carcanet) and it seems the copyright is now defunct. The largest collection of original Clare manuscripts are housed at Peterborough Museum and Art Gallery, where they are available to view by appointment. The thatched cottage where he was born was bought by the John Clare Trust in 2005. In May 2007 the Trust gained £1.27m of funding from the Heritage Lottery Fund and commissioned Jefferson Sheard Architects to create a new landscape design and Visitor Centre, including a cafe, shop and exhibition space. The Cottage at 12 Woodgate, Helpston, has been restored using traditional building methods and is open to the public. Heath, Richard (1893). 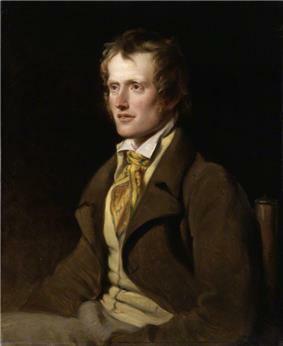 "John Clare". The English Peasant. London: T. Fisher Unwin. pp. 292–319. Powell, David, First Publications of John Clare’s Poems. John Clare Society of North America, 2009. Foulds, Adam. The Quickening Maze, Penguin, 2010. ^ Fowler, Alastair (1989). The History of English Literature. Cambridge, MA: Harvard University Press. p. 250. ^ "First Publications of John Clare’s Poems by David Powell". The John Clare Society of North America. 2009. Retrieved 15 August 2012.